Japan has historically taken many ideas from the U.S. in its business or other sectors to improve at home. These concepts have become massive cultural and economic movements in Japan. Interestingly, Japan takes ideas and changes them into Japanese style. In short, they are “Japanized.” Historically, ideas which came from other countries will stay in Japan permanently, no matter if these ideas disappear in the original place. These ideas are also modified by the Japanese at home. To illustrate, Japan has succeeded in its businesses like automobile, electronic, and cartoon industries around the world. Most of them were originally invented in the U.S., though they have globally expanded. This article will explore one of the strongest “Japanized” American imports, an original U.S. idea, which in its modified version has dominated the Japanese culture and business: “Japanized” hip hop. Many Japanese people enjoy listening to American hip hop today. Some youths actually visit the U.S. to experience real hip hop culture. Despite such popularity, the cultural movement has barely been studied. One of the reasons is that many Japanese adults are unfamiliar with such cultures and see negative factors in hip hop, like blowzy clothes and lyrics about violence. In the U.S., since hip hop is a recent movement, this field of study has not been highlighted yet. However, the enormous trends have obviously occurred among young generations in Japan. Those phenomena have actually been dominating Japanese culture and the music industry, as this article indicates. As a result, this area must not be avoided in order to fully explore the Japanese future economic system. While looking at the Japanese culture and business patterns, this article shows us that the Japanese hip hop movements are economically, culturally, and academically significant. Japanese hip hop has existed in Japan for a long time, even though its sales were not so successful and its Japanese audiences’ perceptions were extremely low; however, in the mid nineties, the “Japanese hip hop revolution” triggered to create today’s massive cultural phenomena. The symbol of the revolution was Thumpin’ Camp, which was one of the biggest Japanese hip hop events in 1996. More than thirty artists and groups gathered. As the title of this event expresses, the artists described themselves as “Thumpin,” which is a lower class of samurai and is considered to be a phrase of disdain in the past era in Japan. The artists referred to themselves this way because in spite of their skills, their names were unfamiliar to Japanese people, so this title expressed the hip hop position in the Japanese music scene. Another theme of this event was the overthrow of old Japanese rap music, which was oriented toward adopted pop melodies that mainstream audiences listened to. At the beginning of this event, the organizer and a Japanese rap musician, ECD, stated “I killed J-Rap,” meaning killing the old Japanese rap music and replacing it. In the last number of Thumpin’ Camp, a prominent group performed: Buddha Brand, which had brought American style hip hop to Japan a year before Thumpin’ Camp. 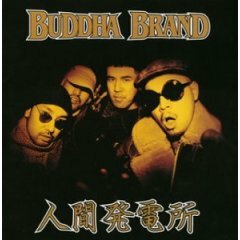 Buddha Brand, consisting of four members, went to N.Y. in the late eighties to learn American hip hop, and when the group came to Japan, a plan of the revolution in the Japanese hip hop, Thumpin’ Camp, began. The members, Dev Large, Nipps, CQ, and DJ Master Key, started playing as DJ’s in local clubs in N.Y. where they met and organized today’s Buddha Brand. Playing in clubs in Brooklyn, such as Gorilla’s Den and Soul Powers in the early nineties, they began to write lyrics as rap singers. While performing and distributing their demos in N.Y., Japanese music and the fashion industry gave special attention to them in 1994. In 1995, as they became more well known, they decided to go back to Japan. In Japan, ECD, an organizer of Thumpin’ Camp, got them together with one of the major Japanese music companies, Cutting Edge, and they released “Ningen Hatsudensho” (“Human Generator”) May 1996, selling more than 100,000 copies. After Thumpin’ Camp, Buddha Brand recognized themselves as a significant pioneer who opened a “port” in the Japanese hip hop industry. Then, they described their appearance in Japan as Commodore Matthew Perry’s arrival into Tokyo Bay in 1854 with Perry’s “black ships,” which forced open the Japanese ports, triggered the end of the Shogunate system, and ushered in Japanese industrialization. In fact, after performing in Thumpin’ Camp, they released a CD called “Kurofune” (“Black Ship”) on December 1996, describing themselves as the “black ship” in the Japanese hip hop industry. Since 1997, the members of Buddha Brand significantly expanded their activities. In August 1997, Dev Large established his record company, Eldorado Records. Since then, he has contracted many local artists to release their products nationally. At the same time, each member started working as a DJ in clubs in Tokyo to play New York hip hop style. In November 1997, the members appeared on a TV commercial for Toyota, and then they released a tie-in CD with Toyota, “Tenmei Ware ni Ari (Utsu Youi)” (“The Heaven’s Hazard is Mine (Ready for Shooting)”). In contrast to their activity, from 1998 to the present, Buddha Brand’s appearances have decreased on the major scene of the Japanese music world. This is because they shifted their roles: they have actively engaged in Japanese hip hop areas by working as producers, featured singers for other artists, and DJ’s – sometimes releasing a CD as solo singer or as Buddha Brand. Even though their appearance in public has decreased, their influence on other artists and Japanese listeners is extremely strong. How do They Get into Hip Hop Culture? Takatsuki found that American hip-hop lyrics about guns and violence are too much for many Japanese listeners; he continues stating that Japanese hip hop lyrics have matured. Japanese hip hop artists have not only modified their lyrics into Japanese ways, but they have also performed showing unique Japanese fashion. According to Takatsuki, some groups, like Rhymester, dress up like samurai warriors. Japanese Artists from the U.S. In the late twentieth and early twenty-first centuries, the Japanese hip hop music industry began releasing many Japanese hip hop artists who learned their skills in the United States. Bennie K is a great example. Bennie K consists of two girls, Yuki and Cico. The singer Yuki went to the U.S. to get voice training as soon as she graduated from her junior high school. The rapper Cico went to the U.S. to experience real hip hop culture just after finishing her high school. They met in L.A. and created the group, Bennie K. In 2001, they debuted in Japan. A few years after, their song “Dream Land,” tied-in with Coca-Cola, ranked second on the Japanese national hit charts, selling more than 500,000 copies. In 2005, their fourth album, “Japana-Rhythm” ranked number one on the hit charts. In the same year, more than 100 schools in Japan invited Bennie K as guests at their annual school festivals. Like Bennie K, many Japanese youths are learning music, dance, and other areas in American hip hop industries. A noticeable fact is that this flow of Japanese artists learning in the U.S. can be contrasted to other areas in Japan. Frederik L. Schodt, states that “far more information flows into Japan than out of it.” He continues to explain, “In 1991, the United States sent only 980 full-time students to Japan, compared to 48,000 Japanese who attended U.S. universities and colleges on student visas and 42,000 who took part in special-education programs of less than three months.” This fact shows that Japanese people can learn important skills in the U.S. and can successfully apply these skills when coming back to Japan. Many parents who wish their children to have a developed education encourage their children to study in the U.S.
Again, it is important to review Buddha Brand’s influence on this phenomenon as the group described themselves to be the “black ship,” opening the “port” of the Japanese music scene. This paper reminds us that Japanese hip hop has become a significant national, cultural, and business genre since the late twentieth century, and this phenomenon has been applied and has succeeded by using almost the same ideology that was historically used by other Japanese industries like automobile manufacturing. The pioneers in the Japanese hip hop industry like Buddha Brand learned their skills in the U.S. and have successfully been influencing the contemporary Japanese music scene. As a result, the imported hip hop has become a “Japanized” products. Many hip hop industries in Japan have modified the American hip hop into Japanese ways, and their businesses, like the hip hop dance schools, have succeeded. Masanori Isaka would like to thank Georgia Southern University professors Dr. Craig H. Roell and Dr. Patrick Novotny for their support in this research.